SARANSK, Russia: Saransk, the smallest of Russia’s World Cup venues, is adjusting to life without world-class football and the joie de vivre of enthusiastic foreign fans, after hosting its final game of the tournament. And for some, it’s all over too soon. Located 650 km (400 miles) southeast of Moscow and with a population of just 300,000, Saransk was a surprise World Cup host choice because it lacked necessary infrastructure and its own soccer club was languishing in the lower reaches of the Russian soccer league. After building a new 45,000 all-seater stadium, it hosted four group stage matches with the highlight a clash between Iran and Cristiano Ronaldo-led Portugal, which ended in a 1-1 draw. The quiet city had never seen such an exuberant party, with tens of thousands of overseas fans wrapped in their national colors. But no playoff matches will be played there and the locals are settling back into normal life. “I never expected to see such beautiful girls from Iran,” Andrei Kanaikin, 29, an computer specialist said about Iranian female fans, who are banned from attending matches back home. Kanaikin said he will miss the joyful foreign supporters and watch the games on large screens put up in fan zones. “I don’t know what to do now, I’m thinking of flying abroad to watch Champions League matches now,” he said, looking tearful. Alexander Moskinsky, 56, a manager at a construction firm, said the World Cup put Saransk on the global map. “No one knew about Saransk, even in Russia let alone across the world. Now everyone has heard about it,” he said. He admitted that he was not a big soccer fan, but went to the match between Peru and Denmark. Mikhail Chikin, 53, a bank clerk, said it had been a “fairytale” experience. Saransk is the capital of the Russian republic of Mordovia, a predominately agricultural region, and does not benefit from the petrodollars showered on oil-producing regions. The World Cup was therefore a welcome boost to the economy. “With each year of preparations for the World Cup, Saransk improved more and more. 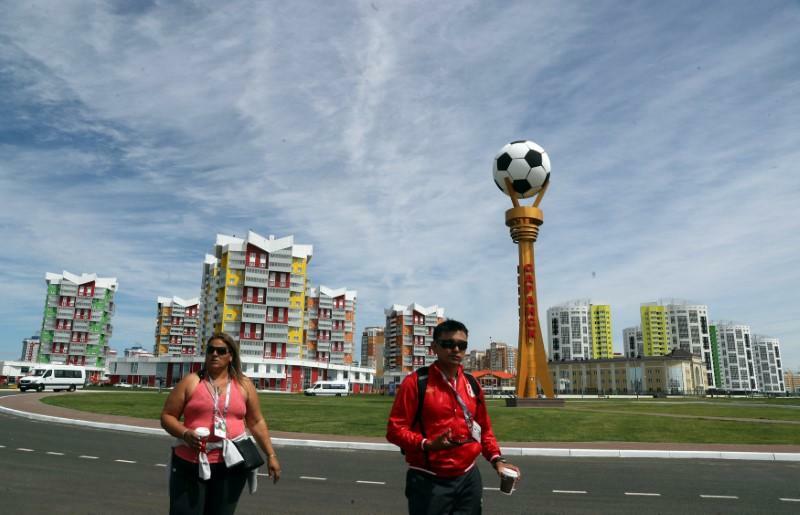 For us, the World Cup is everything, the economy and a better quality of life for people,” Mordovia Governor Vladimir Volkov told Reuters before the last game the city hosted, between Panama and Tunisia, on Thursday. “I already feel a little twinge of sadness. Everything is bubbling here, but silence will fall in the morning suddenly and it will be unusual,” he said, while walking around food stalls in a city square.